Greece - With 3,771 deaths, 2015 was the deadliest year on record for migrants and refugees crossing the Mediterranean trying to reach Europe, reports IOM in a year-end summary. 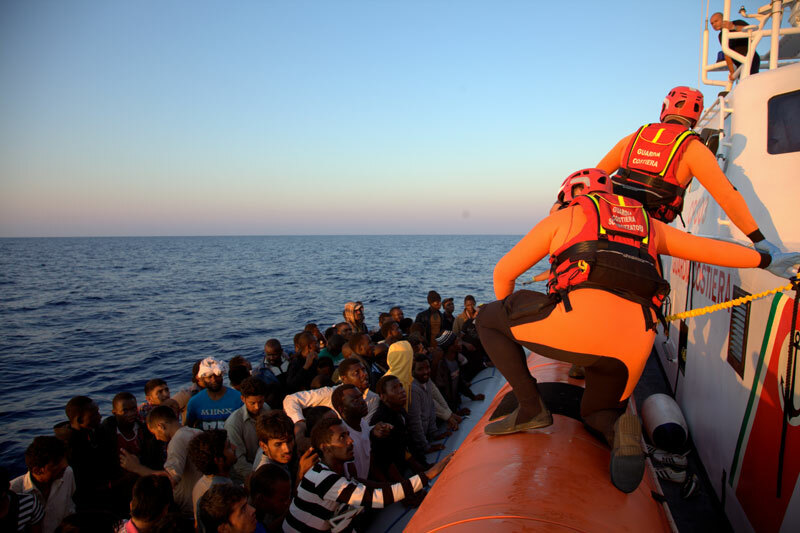 By comparison 3,279 deaths were recorded in the Mediterranean in 2014. Globally, IOM estimates that over 5,350 migrants died in 2015. IOM also recorded total sea arrivals to Europe in 2015 at 1,004,356 or almost five times the previous year’s total of 219,000. Seventy-seven per cent of the deaths occurred in the Central Mediterranean route mostly used by smugglers operating from Libyan shores. This compares to 97 per cent of migrant deaths recorded along this route in 2014. In 2015, 21 per cent of deaths occurred in the Eastern Mediterranean compared to only 1 per cent in 2014. In the Central Mediterranean, deaths recorded were down by 9 per cent from last year with the rate of death at 18.5 deaths per every 1,000 travellers. Globally, the majority of the estimated 5,350 deaths were recorded in the Mediterranean, the most deadly region, followed by Southeast Asia (mostly in the Bay of Bengal, Andaman Sea, Malaysia and Thailand) which saw at least 800 deaths this year. Within Mexico and along the US-Mexico border there have been at least 330 deaths recorded this year. IOM Greece reported that 106,776 migrants crossed into the Greek islands during the month of December, an average of over 3,400 per day. 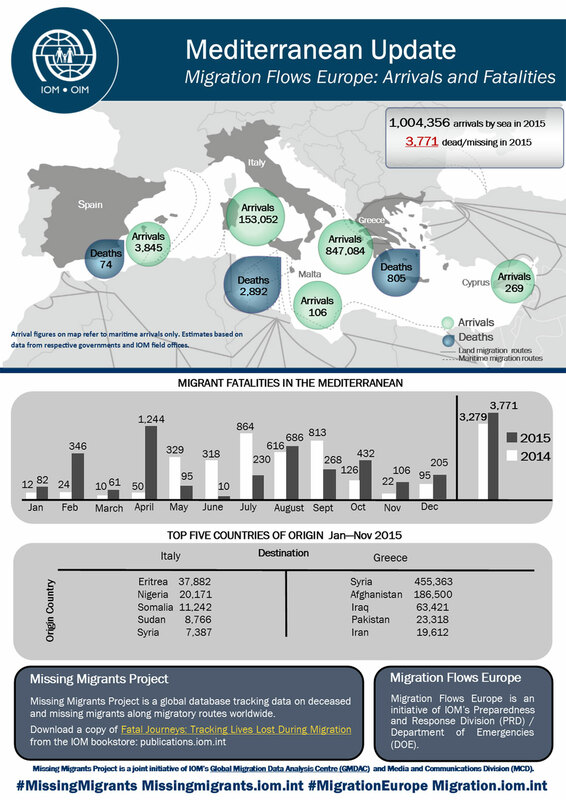 Total migrant inflows through the blue borders of Greece approached 850,000 arrivals for the year. Over 800 migrants or refugees lost their lives on the Eastern Mediterranean route in 2005, including one four-year-old girl during the year’s final hours at the Kara Tepe reception area on the Island of Lesvos. She reportedly suffered from meningitis and died in a nearby hospital. The New Year began with the death of a two-year-old child as the Hellenic Coast Guard rescued 39 migrants from a boat which capsized off Agathonisi Island. IOM estimates just over 5,000 migrants and refugees crossed into Greece during the first three days of 2016; 41 per cent were from Syria, 37 per cent from Afghanistan, 12 per cent from Iraq, 6 per cent from Iran, 2 per cent from Palestine and 2 per cent other nationalities. IOM Turkey reported statistics from the Turkish Coast Guard Command that tally 279 migrants or refugees perishing in Turkish waters in 2015, 71 of them in December alone. IOM Turkey said 18 migrants or refugees lost their lives in the week of 14-20 December 18; during the following week (21-27 December) another 44 migrants lost their lives. IOM teams in the former Yugoslav Republic of Macedonia report over 7,500 migrants or refugees have crossed into that country since the start of the year, most from Syria, Iraq and Afghanistan (see below).